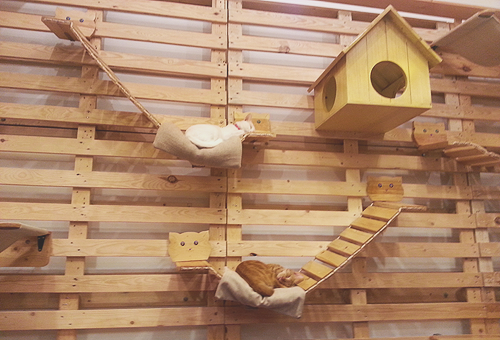 In keeping with my resolution to get out more and to explore the Sikatuna area (which we moved to a few years ago), I decided to make a reservation at Cat Cafe Manila. 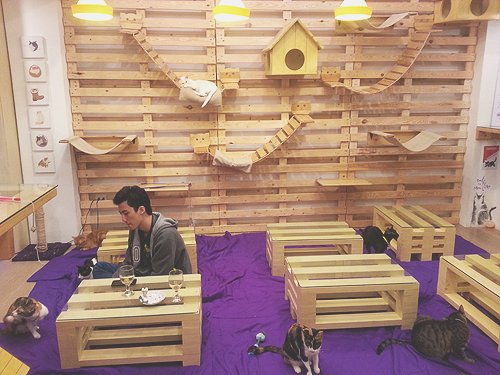 I've always liked the idea of animal cafes (which are really popular in Japan), and have read that the concept is to create a relaxing space for people who are stressed out or feeling lonesome. This video, for example, shows just how therapeutic being around kittens - and, I'm adding, puppies - can be. They're also for people who don't have pets of their own, which often results from living and working in the city. 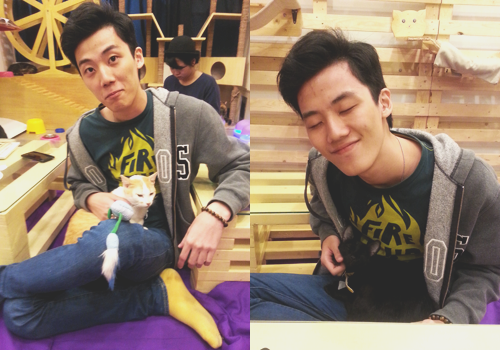 So, when I started hearing about all these animal cafes popping up around town, I knew that I had to try them out. 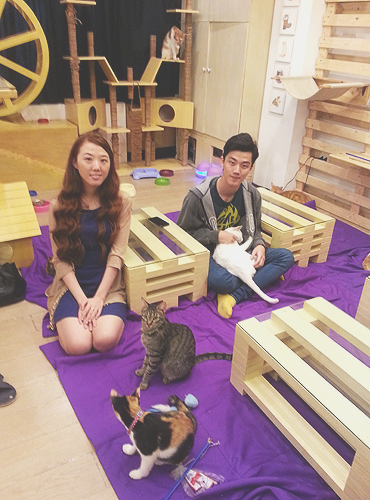 Located on the 2nd floor of 189 Maginhawa Street, Cat Cafe Manila is on a mission to promote "responsible pet ownership". What you'll also find when paying them a visit is that all their resident felines were once strays, and are up for adoption via CARA Welfare Philippines. 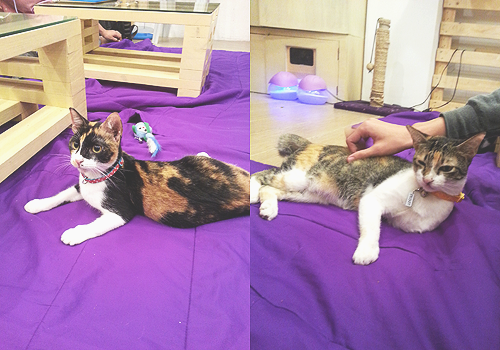 In fact: just a week ago, two of their residents, Oreo and Bicco finally found their forever homes. We're grateful that we got to meet them before they moved out. Since the cafe can only take 15 people at a time, you will first have to make a reservation and wait for the email confirming your appointment. Don't worry, this doesn't take long. Each slot lasts for an hour, and you pay P200 (per customer) upon entering. Half of that amount goes to caring for the residents (food, medical expenses, etc. ), while the remaining P100 can be used to purchase food and drinks at the cafe. Pao and I highly recommend their cookies, which are slightly and deceptively crunchy at first bite but sinfully chewy at the core. Once inside, you'll see a sink on your left where you can clean up (and play around with the mirror), and a shoe rack where you'll be asked to switch to slippers. Don't forget to sign the visitor's waiver and read the house rules. Oh, and the purple notes on the walls? They're from previous customers; I'm sure you can write one of your own before leaving. I loved the layout of the place! It was like walking into a nursery - so warm and inviting. You can choose to sit at one of the counters, or on the floor. Pao made himself right at home, while I had to sit seiza-style because I was in a dress and forgot to wear shorts underneath. There weren't too many other customers though, so I was able to stretch my legs every now and then. How many fandoms and characters can you name? 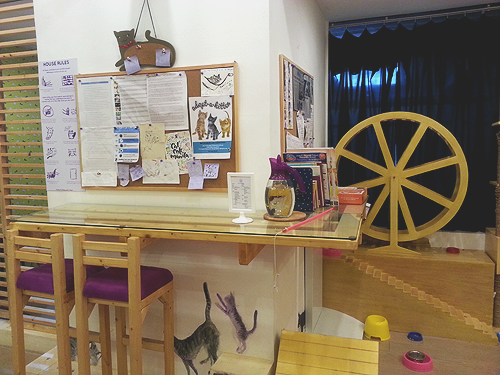 The tasteful doodles, which you could find all over the cafe, added to its general ambiance. One of their newer residents, Keiko, is my absolute favorite. She was the first to approach us and kept on playing with us. 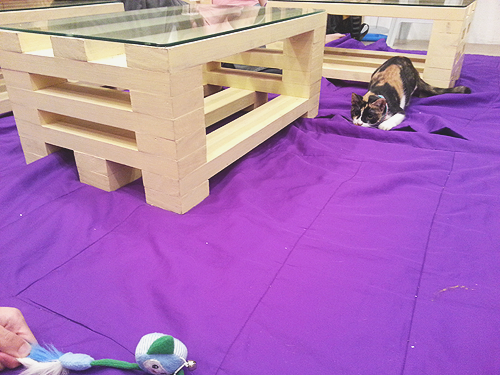 I guess it helped that Pao was luring her in with a toy, but, really, look at that face! (You look like my next mistake.) We don't have cats at home, what with all our dogs, so it was refreshing to be around the residents. Pao favors Peggy, who was snoozing next to our table for most of our stay. Initially, most of the cats were sleeping and, while I did enjoy taking photos of their adorable sleeping faces, I was worried that we had come at a bad time. (We chose the 7:00-8:00 pm slot on a Thursday.) But, one by one, they started to wake up, probably because they were getting hungry and hopefully because they sensed that Keiko was having a blast with us. As a result, we were able to interact with all the residents and ended up staying about thirty minutes longer than we intended - which I've since found is all right with the staff, as long as it isn't during their peak hours. 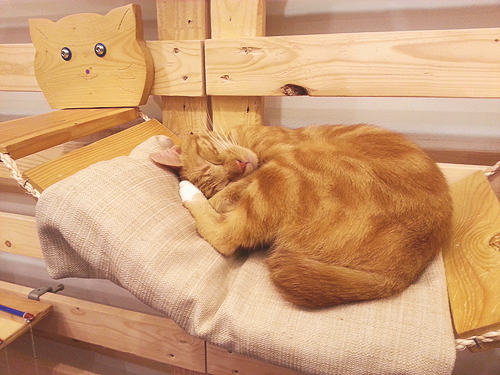 I got to chat with one of the owners, who explained that there was no need to worry about getting scratched or bitten, since the cats saw the vet twice a month. They all seemed to be perfectly at ease around people as well. I guess that, as long as you don't go out of your way to irritate them, they'll treat you like you're someone they see everyday. Like, I noticed that while I was chatting with Pao, a few of them kept coming over to sniff the inside of my bag. I imagine this was because it curiously smelled like beagle and vanilla. I also spent a few minutes perusing their books. Now, I'm thinking of starting my own collection. I know, I don't have cats of my own, but one can never have enough books! Before leaving, you have to check out all the awesome merchandise. 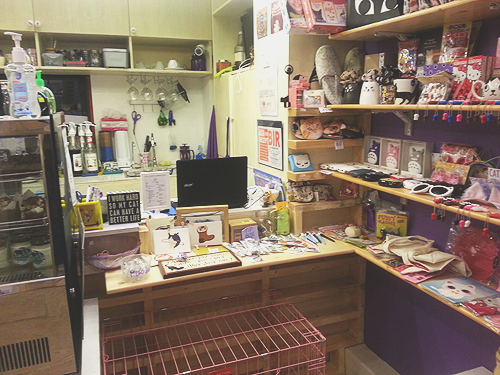 Part of why I thought of visiting the cafe was because I saw that Hodge Podge had made exclusive items for them. I especially love their bookmarks. We had a really great time. 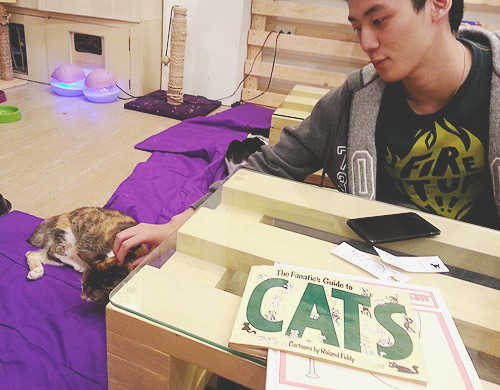 Thanks for having us, Cat Cafe Manila! If you're interested in visiting and want to avoid the crowds, my advice is that you try hitting them up on a weeknight. Go have a nice meal at one of the many restaurants along Maginhawa, then wind down at the cafe. The staff is incredibly accommodating, and getting to meet the residents may change your perspective about the strays you encounter everyday. 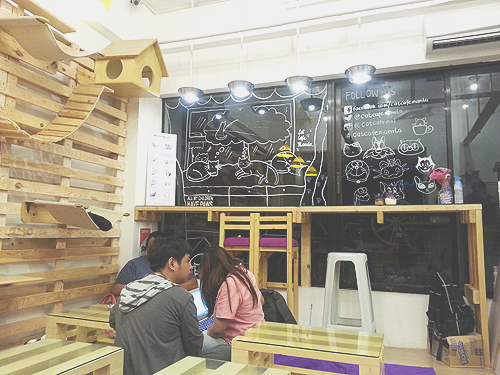 ☛ Aside from checking out their site, you can find Cat Cafe Manila on Facebook, Twitter, and Instagram.